Gaylor Lakes Disambiguation: This is a separate hike from the better-known Gaylor Lakes trail, which leads to the basin containing the Granite Lakes and the two upper Gaylor Lakes. That basin isn't far from here, though, as you can see on the trail map. The Lower Gaylor Lake inlet is also the Lower Granite Lake outlet. Why hike to Lower Gaylor Lake? This is probably your best shot at walking for an hour and having a high-scenery Yosemite lake all to yourself, as well as your best chance to walk for five minutes and sit in your own personal meadow. It's a hit-or-miss affair, though: while hikers on the main Gaylor Lakes trail will be scattered among four lakes and an abandoned mine, anyone on this trail will end up congregating at the lake, and a few adventurers from the main Gaylor Lakes trail may find their way down here as well. Scenery Summary: It's a small but highly picturesque lake, with mountains along the north shore, a meadow as big as the lake spreading away to the south & west, and views beyond the lake & meadow to Mammoth Peak and sundry other mountains that lie south of Tioga Road. Within half a mile of the trailhead - and better yet, before the trail starts climbing - the trail skirts the western edge of a small but pretty meadow with a stream running through it (this stream is the merged outlet of both Granite Lakes and all three Gaylor Lakes). Its location is readily visible on the satellite view of the trail. Best Time to Visit: Should be pretty any time the Tioga Road is open, though the trail might be covered with snow early in the season, and mosquitoes will be more prevalent early in the summer. Crowd Factor: Low. Just finding the trailhead is something of an accomplishment. Difficulty: Easy, albeit approaching the moderate category. It's a short hike, but climbs steadily - 800 feet in all, with one brief steepish stretch - and reaches the 10,000-foot mark at the lake itself. Parking: A pullout at the trailhead can hold two cars if they're cozy. Additional small turnouts are scattered along the road here and there - you can find one a hundred meters or so west of the trailhead. Nearest Bathrooms: At the Tuolumne Meadows Lodge, the turnoff for which is 2.5 miles (4 km) west. Nearest Snacks: There's a grill and convenience store along the southern edge of Tuolumne Meadows, some 3 miles (5 km) west. Bearproof Lockers: None at the trailhead, but you can find gobs of them at the trailhead parking lot near the Tuolumne Meadows Lodge (the same lot that's the trailhead for the back route to Lembert Dome and Dog Lake); the lodge turnoff is 2.5 miles (4 km) west of the Lower Gaylor Lake trailhead, and the parking lot is roughly another half mile along the lodge road. Getting There: The trailhead is a little over 4 miles (6 km) west of the park entrance at Tioga Pass and around 42 miles (68 km) east of the Tioga Road's western terminus at Crane Flat. 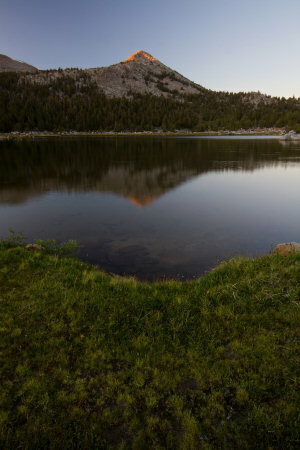 It's about 3 miles (5 km) east of Tuolumne Meadows, and 2.5 miles (4 km) east of the Tuolumne Meadows Lodge turnoff. Here's a Google Street View panorama of the trailhead area. Finding the Trailhead: This can be a bit tricky. The trailhead is tucked away in the woods about three miles east of Tuolumne Meadows on the north side of the road. There's no sign designed for drivers to see, but there is a trailhead mileage sign for hikers, parallel to the road, that you can spot from your car if you're paying close attention and not going too fast. There's also a small pullout here. You might try watching for a gated dirt road, also off the north side of Tioga Road, that lies about half a mile west of the trailhead; when you see that, you're getting close. You can also time the odometer for 2.5 miles east from the turnoff to the Tuolumne Meadows Lodge, which will get you even closer. If this proves to be too much for you or you can't find a place to park, another trail leaves from near the Tuolumne Meadows Lodge, which has lots of parking, and reaches the main trailhead after about two miles, stretching the hike into a solid 8-plus mile workout. Trail Notes & Hazards: As always, where there are lakes and meadows, the spring and early-to-mid summer will bring mosquitoes, who'll be buzzing with joy at the arrival of blood donors who aren't covered with lots of pesky fur. The trail, though generally smooth, does have some spots full of rocks and roots waiting to faceplant inattentive hikers. Watch your step if you're hiking by headlamp. The elevation can be a factor if you're not used to it. If you think you feel yourself getting sucked towards the moon, it's probably not the earth's reduced gravitational pull, but altitude sickness instead. Seek help. Already been to Lower Gaylor Lake? Submit a Review.